GPS capable smart phone has been widely used for road navigation. GPS positioning data is normally updated every several seconds, which makes navigation guidance lag the real driving situation. Especially, steering angle of steer wheel and current speed can not be obtained instantaneously by GPS positioning. The invention of this patent discloses a method to obtain steering angle and current speed by capturing image the instrument cluster of vehicle and use the steering and speed data to improve accuracy and responsiveness of navigation guidance or give warning for driving hazard. 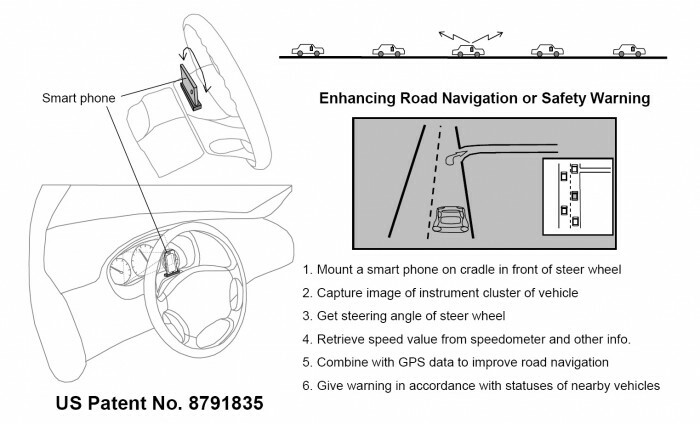 To implement the method, a smart phone is mounted on a cradle in front of steer wheel so that built-in camera of smart phone can take image of the instrument cluster. During driving, current speed can be obtained by processing the image of the speedometer. When steer wheel rotates, the captured image is tilted accordingly. By processing the tilted image, steering angle of the steer wheel can be obtained from the tilt angle of the image. This provides a nearly real-time approach to obtain steering angle and current speed of the vehicle. Subsequently, the steering angle and current speed can be used to enhance accuracy of positioning and give timely responsive navigation guidance or safety warning. Furthermore, the smart phone may broadcast wirelessly the driving status of the vehicle to nearby vehicles. If nearly vehicles broadcast their driving status as well, by receiving the broadcasted information, the smart phone can have a comprehensive view of moving statuses of nearby vehicles. The moving statuses of nearby vehicles in conjunction with the driving status of the current vehicle are analyzed by the smart phone to detect potential risk of collision. If a potential collision is found imminent, driver of the vehicle will be warned accordingly to avoid the collision. Other status data of vehicle such as turn signal, fuel gauge and engine status may be obtained as well through processing the captured image. The invention expands usage of smart phone to enhance driving safety. The patent is offered for sale. Licensing option can also be considered. But, sale of the patent is preferred. The patent is recently granted and offered for sale. 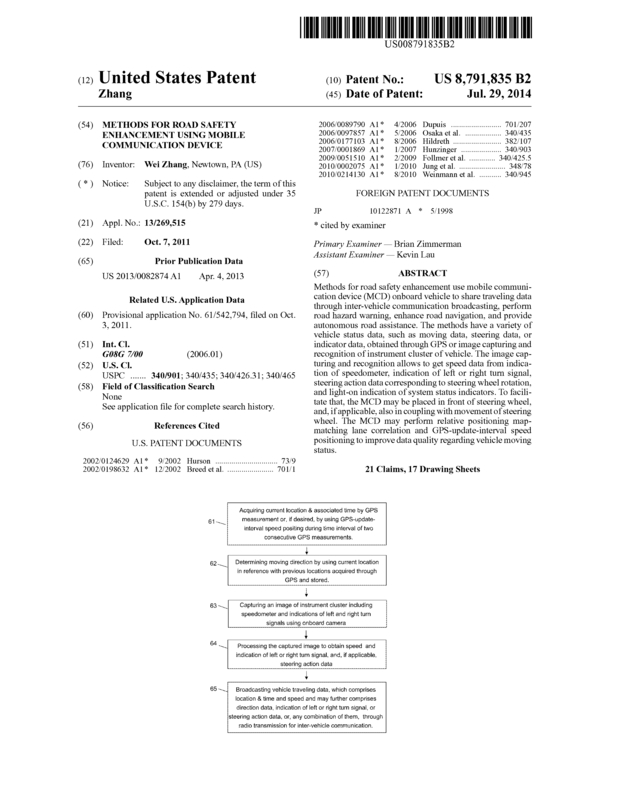 Page created at 2019-04-25 20:18:43, Patent Auction Time.